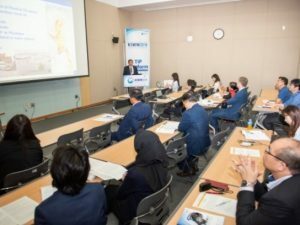 From 12th to 15th September, the Korea International Water Week (KIWW) 2018 was held in the Daegu City, Republic of Korea. 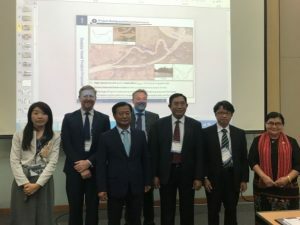 Japan Water Forum (JWF) organized a session “Pathway Forward: to promote cooperation among the development partners to address Flood Risk in Myanmar” as part of the Technology, Implementation, Policy (TIP) Platform of the KIWW 2018. The details of the session JWF organized is described below. In Myanmar, infrastructure and economic development are progressing rapidly with the transition to civilian rule, but the damage caused by floods has occurred frequently. Currently, various development partners delivered their development assistance to Myanmar by making use of their thematic interests and strengths. However, there are the issues of coordination among development partners and domestic related organizations. In order to promote “Facilitate the implementation of integrated water resources management at all levels”, from the 3rd Asia-Pacific Water Summit “Yangon Declaration: the Pathway Forward”, this session was organized to explore the ways to develop a disaster risk management platform. In order to assist informed decision-making for national and local development planning, as well as for promoting public and private investment, usable meteorological and hydrological information must be provided to local communities in Myanmar. The session also sought to examine how to facilitate effective coordination among development partners by sharing information toward integrated flood risk management in Myanmar. Representatives of Myanmar, Japan, World Bank and Republic of Korea first shared their initiatives that aim to support Myanmar in addressing the flood risk management through water resources management. In a subsequent panel discussion, speakers discussed ways to develop measures to strengthen local human capacities in terms of science and institutional aspects. They also discussed ways of promoting collaboration by catalyzing the development partners’ assistance, utilizing holistic and participatory approaches in addressing flood risk management. The following points highlight main outcomes of the presentations and discussion. The challenges to address flood risk management are exacerbated by the lack of a clear understanding of the impact of development, the magnitude of flood hazards, the shortage of resources and lack of political will. These factors have to be addressed by enhancing coordination and engagement across disciplines in balance with each other. If the National Water Resource Committee and National Disaster Management Committee collected information about each development partner’s support and their new fresh ideas, this would contribute to the promotion of activities to address water-related disaster in Myanmar. It is important to create a virtuous cycle of continuous re-enforcement between investments in Infrastructure, Data and Information, and Institutions, as there are increasing numbers of projects, sponsored by different partners and within different Ministries, Departments and City Authorities in Myanmar. In promoting the collaboration and cooperation to address integrated flood risk management in Myanmar, the challenges are how to tackle the gap between the reality and the expectations from various relevant organizations and how to deal with the challenges. It is important to start addressing the non-regret measures in terms of mid-to-long-term perspectives by sharing the information and experiences. The causes of floods in Myanmar are both natural and man-made. The causes of man-made floods are deforestation, irrigation and mining. Although the government has aimed to stop illegal logging by law, it is difficult to crack down. Multi-stakeholders’ partnerships’ collaboration addressing the root causes of the man-made flood is urgently needed.